http://wicktattoo.com/?p=188 where can i buy finasteride in south africa Is your wealth in the house (equity) liquid? Is it accessible? To answer that question you must first understand what we mean by liquid. Let’s define liquidity as the speed and ease with which you may convert your wealth to cash. This is an important distinction because typically when a homeowner needs to access the wealth in their house speed is of the essence. 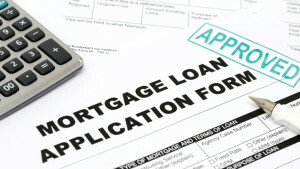 There are only two ways to convert the wealth in the house to cash: 1) sell the house, and 2) borrow against the house. Selling the house provides complete use and control of the cash, but you would lose the use and control of the house. Borrowing against the house provides complete use and control of the cash and complete use and control of the house, as long as you make monthly payments on the mortgage. 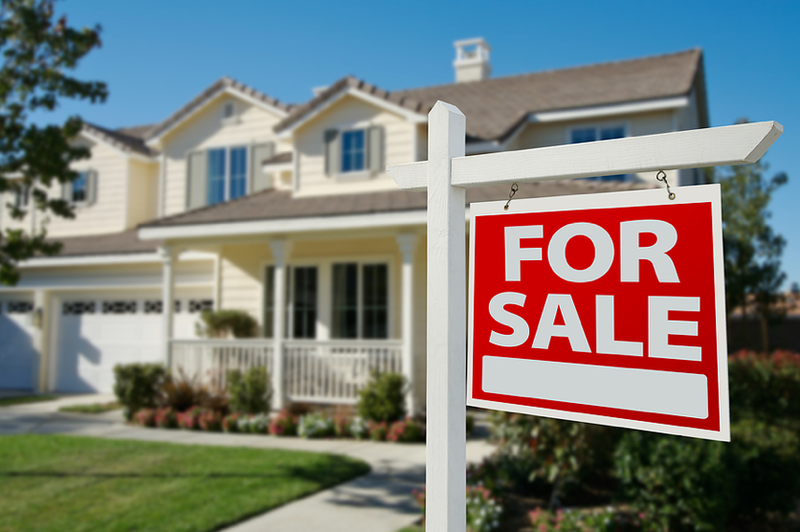 When you sell the house, you end up trading use and control of the house for cash. To list, market, sell, and close on a house with useable cash in hand may take 45 days to a year, depending on market timing and the condition and location of the house. How soon you need to convert the house to cash may affect the amount of cash you receive. 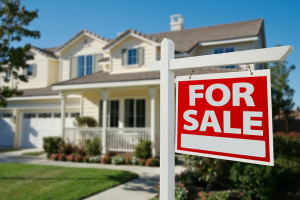 If you need to complete the process quickly, you may have to sell at a lower price. The cash you receive is the selling price at closing minus real estate commissions, fees, and any outstanding liabilities secured by the property. If, instead of selling, you choose to borrow against the house you will have to overcome the four obstacles to borrowing. A lender will look first at your willingness to repay your debts (Credit), then at your job stability (Character), then at your income (Capacity), and finally at your equity (Collateral inside the house). In other words, the liquidity of the wealth in your house is relative to your individual strength as a borrower. You may also be limited by the appraised value and the condition of the house at the time you borrow. There are a number of things that can make the house the cause of a lack of liquidity. Borrowing is always subject to the current lending guidelines and eligibility requirements set by Fannie Mae, Freddie Mac, FHA, and VA, to name a few. With most financing options the process of converting the wealth in the house to cash takes about 30 to 60 days. Any change to your income or expenses will affect your capacity ratio and increase or decrease your ability to use and control your wealth in the house. Most people learn about these obstacles by running into them at full speed while in the middle of trying to borrow against the value of the house for a specific need. This is probably the most painful way to learn a lesson in liquidity. The following is a list of common threats that can become obstacles to accessing wealth in the house. 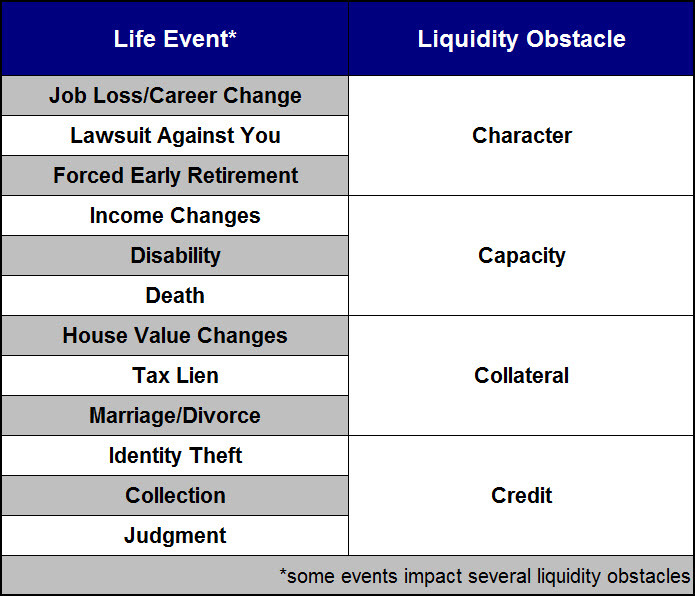 Many of these life events accompany an increased need for liquidity. Ironically, your ability to gain access to the wealth in your house when you need it most is challenged by guidelines that are designed to prevent access to that wealth in the event of a financial hardship that would create more risk to the lender. It is important to remember that your wealth inside the house protects the lender first, while your wealth outside the house protects you first. We believe it is better to have access to the wealth in your house and not need it, than to need it and not be able to get to it. Keeping home equity safe and liquid is really a matter of positioning yourself to act upon opportunities rather than be forced to react to unexpected life events over which you have no control. So, I’ll ask the question again; Is the wealth in your house (equity) liquid? We believe the answer is a resounding NO! The wealth in your house is much less liquid than most other investments, and various life events can cause it to become totally illiquid.